BP17 masterclasses will be held on the pre-conference day, i.e. Thursday, 4 May 2017. Each masterclass will last 3 hours net, with an additional 30′ coffee break at halftime. A detailed description of each masterclass is available by clicking on the respective images. We’ll have a conference registration desk at the hotel before and after masterclasses, as well as during the lunch break – you can pick up your badges there. All masterclasses will take place at Hotel Aréna (the conference hotel). 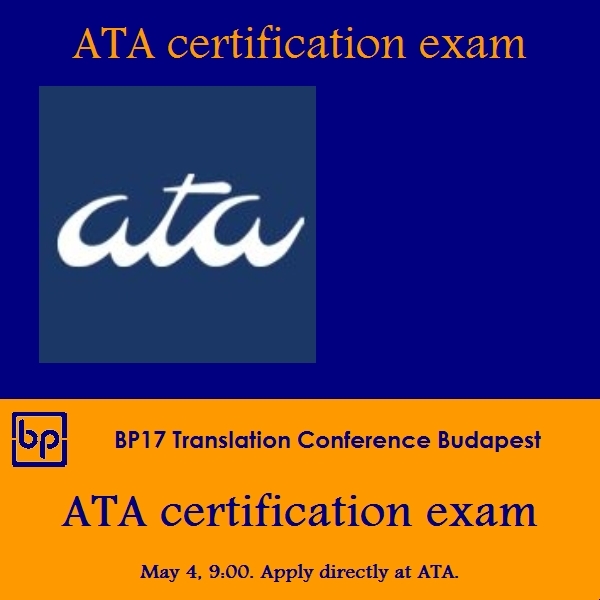 An ATA exam will also take place Thursday morning. Apply directly at ATA. 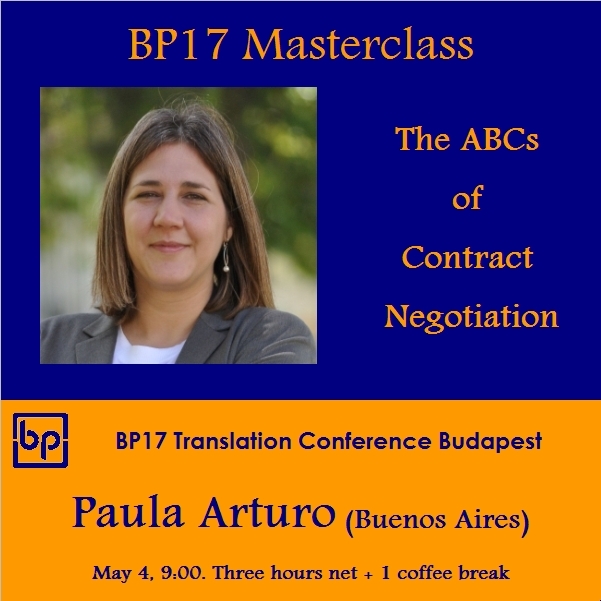 All masterclasses are priced separately from the main conference event. Go to the conference web shop to purchase these items. Look for the same images as above. 9:00 – 12:30 Morning masterclasses. Coffee break 10:30 – 11:00. 9:00 – 12:00 ATA exam. Arrive early to allow time for ID checks. 9:00 ‘Absolute’ walk leaves from the hotel lobby. 14:00 – 17:30 Afternoon masterclasses. Coffee break 15:30 – 16:00. 14:00 ‘Hidden Budapest’ walk leaves from the hotel lobby. 14:20 – 17:00 Afternoon cocktail with Henry Liu at Hotel Aréna. 19:30 – 22:30 Welcome dinner at Anker Klub (downtown). Allow 20 minutes from the hotel. 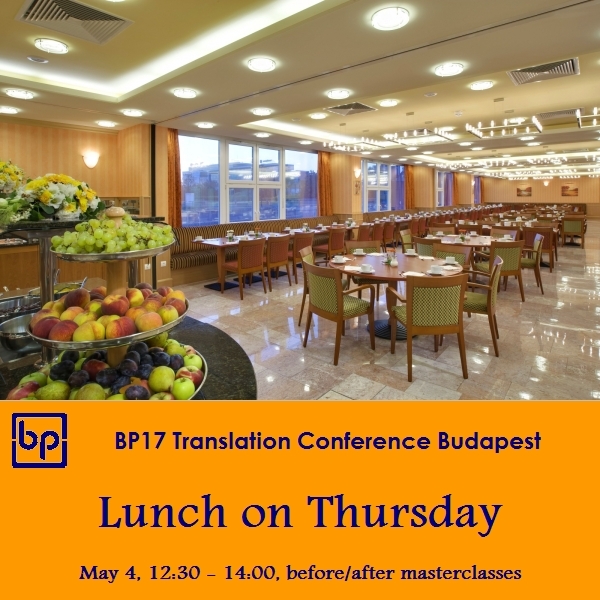 Lunch is not included in masterclass tickets, but it’s available at the hotel restaurant. The hotel recommended people who wish to have lunch on Thursday order it in advance. The reason is they’d need to cater to a large number of people in a short time frame. The hotel will prepare three kinds of set menus: vegetarian, poultry, and beef. Specific meals will be announced later. Each set menu includes soup + main course + dessert + one glass of non-alcoholic drink, and costs 22€ + VAT if applicable. 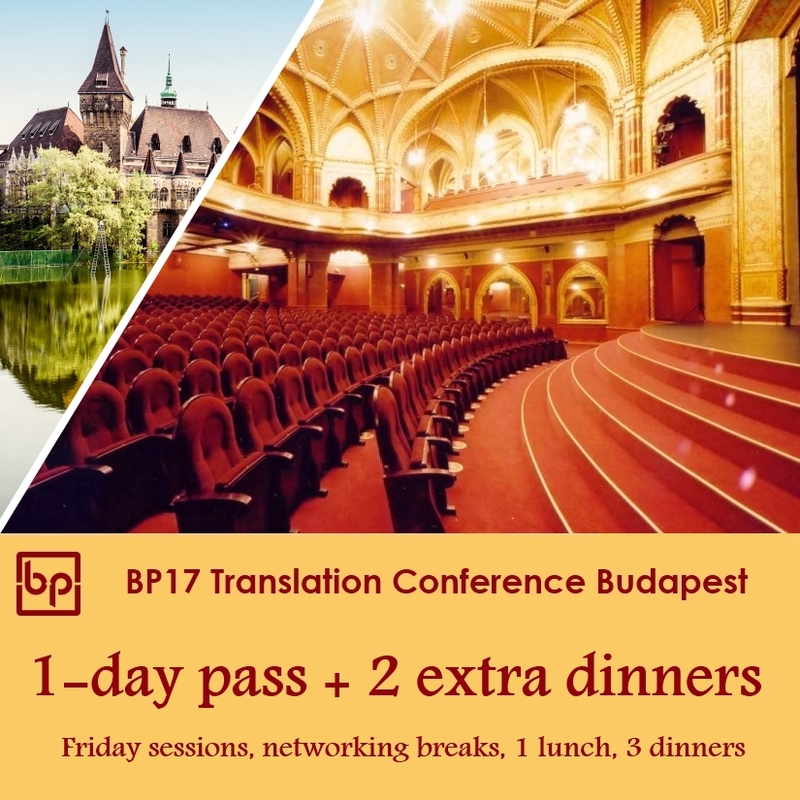 You will receive a little card at the conference registration desk to prove you pre-ordered a lunch, and you’ll need to present this card at the restaurant. If you’re interested, please add this item in the webshop. After placing your order (with all the other conference items), you will receive a link to the registration form: at the bottom of this form there’s a free text field. Please indicate your menu choice in this field (i.e. vegetarian / poultry / beef). In theory you can also order food à la carte, but during the break between masterclasses (12:30 – 14:00) the restaurant will be busy catering for people who pre-ordered their lunch. 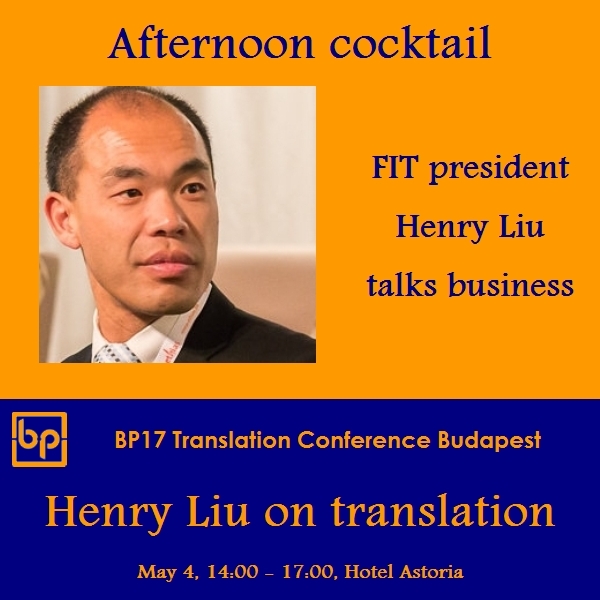 Henry Liu, president of FIT, will deliver a speech with the working title ‘Why join professional associations when you’re on LinkedIn?’. 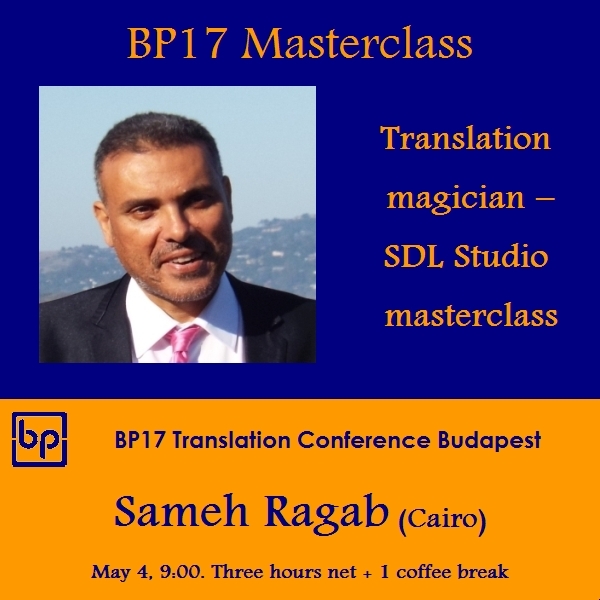 The session is geared to representatives of translators’ associations, but anyone is welcome. The speech will be followed by a Q&A session, and some networking. Snacks, desserts, coffee/tea, refreshments are included. This session will take place between 14:20 and 17:00 at Hotel Aréna (conference hotel). The entrance ticket costs 50€, and this amount includes a contribution to Mr Liu’s airfare from New Zealand. Our traditional welcome dinner takes place on Thursday, 4 May, 2017, starting 19:30 at an easily accessible and affordable downtown location. The ticket includes buffet dinner with 4 drinks of your choice. People with special diets (vegan, lactose-free, gluten-free) will receive meals specifically prepared for them – you can mark these special diet needs on the conference registration form. We’ll have a conference registration desk where you can pick up your badges. We’ll also have a sweet exchange and a book exchange table. The idea is that you can bring some sweets or other edible goodies from your home country and swap them to other sweets that other conference attendees brought. The same goes for the book exchange table – these two will be located at different areas of the restaurant to force you to move around the room. The welcome dinner takes place at Anker Klub, at Anker köz 1-3, Budapest 1062. This is just a few steps from Deák tér, a busy metro line hub. Getting there from the conference hotel: There’s a metro stop right next to the hotel: as you walk down to the tracks, take the metro on the left, direction Déli pályaudvar. You’ll need to get off at the 4th stop: Deák Ferenc tér. There are two exits from the platform: you’ll need the one to the right, saying ‘Exit’ / ‘Deák Ferenc tér’. (The other exit takes you to metro line 3.). As you step off the escalator, turn left and walk through the entire hall, reaching a shorter escalator. After this, you’re just below street level: turn left again, and at end of the corridor turn left again. Once on the street, walk ahead till the first corner (Yves Rocher shop), and turn right. Anker Klub will be on the right after some 30 meters. Count on about 20 minutes from the hotel. The welcome dinner is included in the following types of tickets. These are the images you’ll see in the webshop once registration is open. 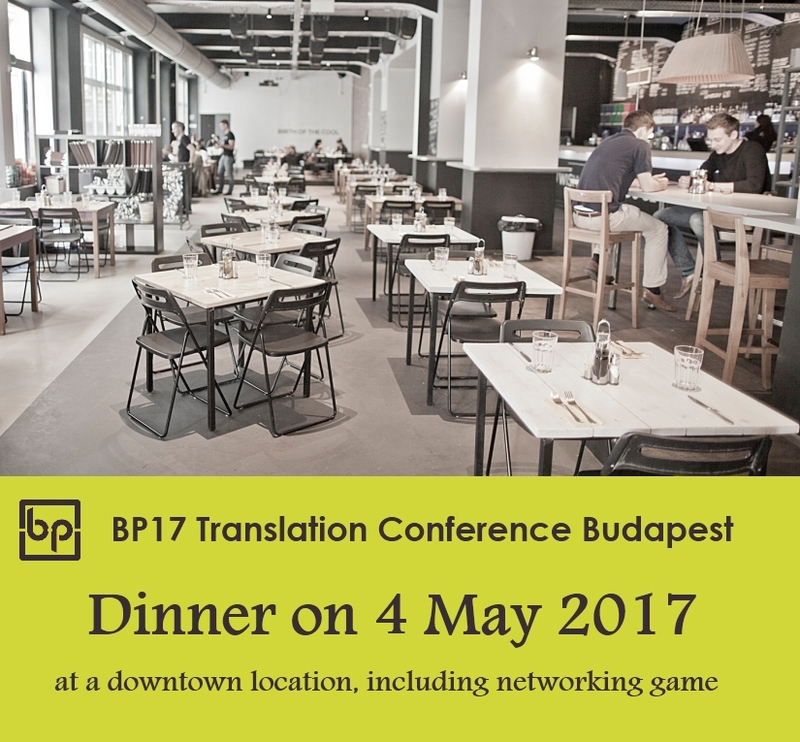 If you buy any of the conference packages, you can add this dinner for only 42€ + VAT, using the coupon code ‘dinner3’. This applies only at the time of purchase – this is ideal for any visiting spouses, or if you want to add only one dinner. This coupon code will be shown at the checkout page as a reminder. 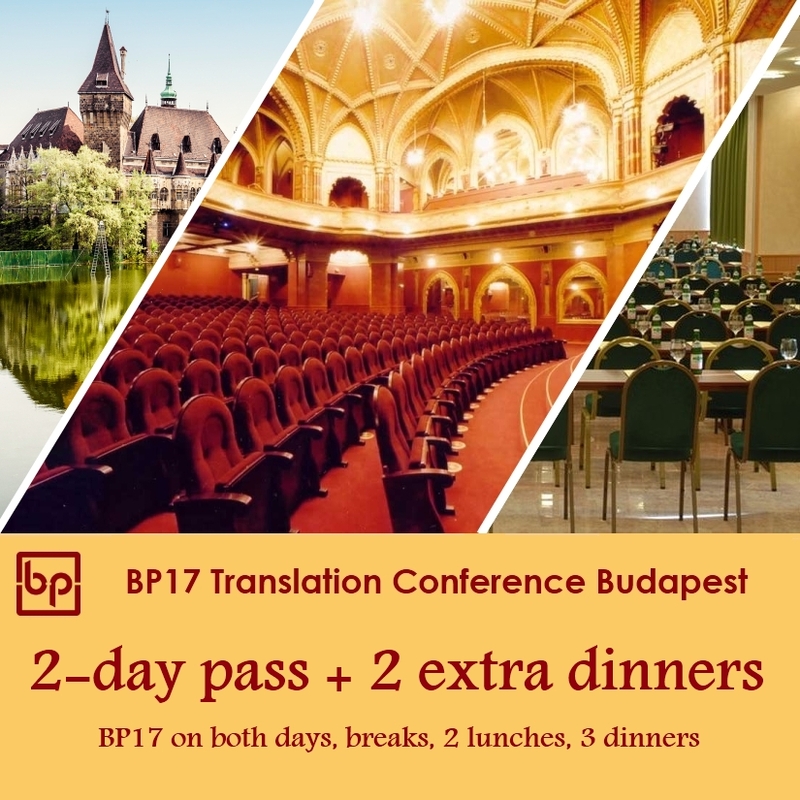 VAT is payable if you purchase your ticket as an individual (or if you’re based in Hungary – in this case you can claim back the VAT amount if you buy your ticket as a company).